Complement your outdoor living area with the finest in quality and practicality, with the perfect companion to your outdoor kitchen, the Firemagic slide-in single side burner. Gives the "built-in" look to complement your grill. 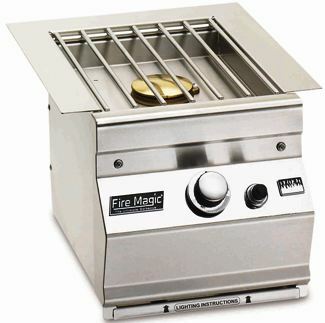 This Firemagic side burner is designed to not only look good, but, is designed for years of dependable service. Features 15,000 BTU sealed flame burner, precise flame control valve and stainless steel cover.